We will discuss here about the balanced diet. The food that we eat everyday is our diet. Our diet must provide our body all the nutrients in proper quantities. Only then we will stay fit and healthy. To remain fit and healthy, our diet should contain proper amount of proteins, fats, carbohydrates with enough quantity of water, mineral salts and vitamins. A diet which contains all the nutrients in sufficient amount as required for proper functioning of the body, such a diet is called a balanced diet. No single food contains all the nutrients in the right amounts. For a balance diet, therefore, we need to eat a variety of food daily. To make the selection of a balance diet easier, food items have been divided into the following four groups. A balance diet should contain food items from each of these groups. Protein group: Some of the food items such as meat, eggs, fish, beans, nuts, peas, etc. Milk group: Some of the food items such as milk, curd, cheese, etc. 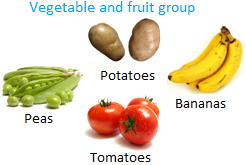 Vegetable and fruit group: Fresh vegetables and fruits. Cereal group: Some of the food items such as rice, bread, chapatti, noodles, etc. A balance diet may vary for different kinds of persons, for example, sick person. Growing children need energy rich and protein rich diet, while sick persons need vitamins and mineral rich diet.